The February 2nd Radio Biafra London Broadcast anchored by IPOB Leader, has indeed exposed the subdued and lowbrow state of Nigeria presumed erudite and discerning minds. The uproar against a simple historical exposure, has left the International community speechless over the poor educational system of Nigeria and this in turn adds to the already filled embarrassment tank in Nigeria. I am convinced, the civilised World are now in cognizance, with the reason behind White Man supreme reign over the Nigeria Black Man. Yes.. It is narrowed to the Nigeria Black Man, not even the least populated Country in Africa. The intense display of shame over Mazi Nnamdi Kanu's history teachings, has compelled me into advising Nigeria Youths, to stop being mentally Lazy, by letting the World know, they only studied for Six months in the Nigeria dilapidated Universities and spent 3years and 6moths on Asuu strike action, for a Four years programme. In civilised World when an exposure or submission is publicised in a momentous issue of this nature,highbrow intellectuals hastenly make research, but a contrary reaction is seen in Nigeria, as the downtrodden state of her educational system is always showcased. Would one blame them? Nigeria Government has denied her Citizens History and embezzled Money meant to improve educational value, thus leaving an Asuu Strike Kindergarten product as a Graduate. 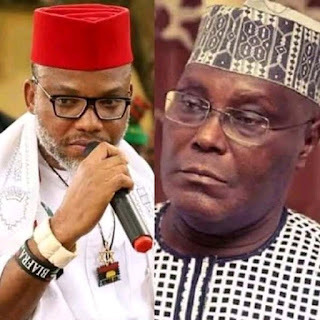 If IPOB Leader who studied in England exposed the history of Old Adamawa which no Nigeria Graduate or Undergraduate has a knowledge of, there is no crime running into the closet to make research, at least with internet Search Machines, if proven right keep mute and no one will compel you into giving credit to Mazi Nnamdi Kanu your presumed enemy. Was Adamawa part of Cameron, before 1961? Was there a Party named NCNC(National Council Of Nigeria And Camerons) when Adamawa was part of Cameron and not Nigeria? Did Adamawa become part of Nigeria through Referendum, from Cameron? Now, you know, acquired knowledge, is the line that demarcates a 2year Old White Child, from a 49year Old Nigerian Black Man. Yes.. The historical knowledge of a White Man, is the reason why even the poorest of them all, reign supreme over the Nigeria Black Man, who claims Wise, yet has not gained freedom from the invented tools of the White Man. It is an International disgrace, knowing that a little exposure of history, can shake the foundation of Nigeria faulted educational system and IPOB will never stop exposing the knowledge bankruptcy of Nigeria youths.